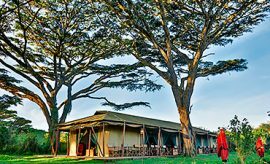 Crater Forest Tented Camp perches at 1800 feet amidst a coffee plantation on the outskirts of the Ngorongoro Conservation Area, with views of the forest-vegetation and the adjacent orderly vistas of farmland. 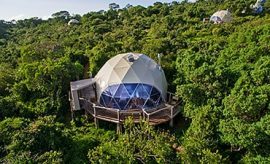 Crater Forest Tented Camp combines all the objectives of the neighboring conservation area: it integrates the preservation and conservation of wildlife with the pastoral pursuits of an indigenous population whilst encouraging tourism and sharing the opportunity to enjoy the wonderful scenery. 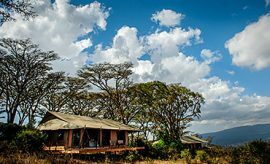 The journey to Crater Forest Tented Camp is authentic African travel at its most memorable. 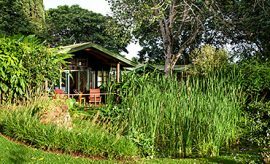 In this tranquil corner of Tanzania, you can enjoy the close propinquity of an amazing richness of animals, plants and birds. 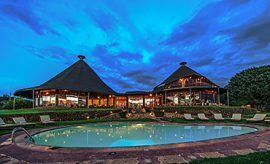 Tranquil, but not quiet for the tropical night is alive on some nights with the sounds of the Ngorongoro lions’ deep lunged roar, a sound you will not easily forget. 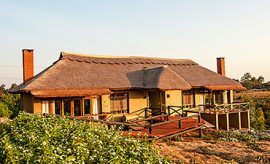 Stray buffalo and elephant roam only meters from the thatched dwellings, raised for safety on sturdy stilted platforms with excellent forest views. Giraffe and impala may be seen on the 10 kilometer drive from the main road which runs from Karatu town to Ngorongoro Crater, both worthy destinations for a day on your Tanzanian safari adventure. 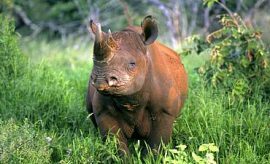 Ngorongoro Crater, a UNESCO World Heritage Site, is protected by the largest unbroken caldera rim in the world, is home to 30,000 ungulates and other mammals, including black rhinoceros, which makes it one of the most visited wildlife havens on vacations in Africa. 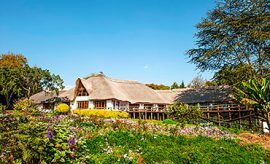 Eco-friendly Crater Forest Tented Camp consists of 15 tented chalets nestled amongst forested slopes, forming a cluster of heavily thatched rooms perched on raised wooden decks (Read more on other types of Ngorongoro accommodations). Each has electric light and hot water to an en-suite, open-partitioned bathroom with shower, hand basin, and flush toilet. Soap and bottled water are provided. 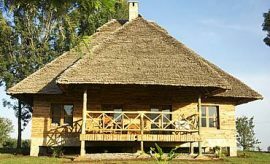 Furnished in native African style with lots of solid, raw wood furnishings including half heighted barked four-poster beds with natural tone duvet and a traditional clay hearth for evening warmth, the thatched tents give the true atmosphere of life in the bush as an affordable alternative to less traditional Tanzania safari lodges and camps. African stone ornaments and woven straw matting complement colorful ethnic cloth bed-spreads and pillow cases with matching lamps hanging from curly wrought iron stands. The shaded verandah also features a balustrade of sturdy tree branches. 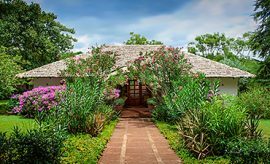 Here, you can relax in cane rocking chairs and enjoy sundowners or even dine to the accompaniment of comforting sounds of cicadas, crickets and nightjars, in combination with the melodies of the mammals who also exchange grunting barks and yelps in the surrounding woods. There is an atmospheric bar, lounge, and dining room with log walls, thatched roof, and a central hearth, a cave-like chimney open on all sides. A small curio shop offers gifts and souvenirs. There is limited telephone access and recharging facilities for cameras and other battery operated equipment are available. A game-viewing trip to the spectacular Ngorongoro Crater must be the highlight of any vacation visit in Tanzania. In the ten mile wide, unbroken walled, open volcanic mixed savannah grassland vegetation, a densely packed population of tens of thousands of hoofed animals and their predators share a wide variety of habitats with hundreds of species of birds. 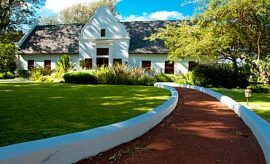 Vervet monkeys and leopard hide in fever-tree forests where you may also see some of the 20 surviving black rhinoceros. Black-maned lion and cheetah hunt bearded wildebeest and buffalo on the grassy plain. Hyena and jackal lope behind. Old giant tusker elephant loom like ponderous grey boulders. Hippopotamus wallow in the marshes. Lesser flamingo poses in the central lake - Magadi. You may also spot more elusive serval or leopard. Other Tanzanian trip activities include day tours to the beautiful Lake Manyara, described by Ernest Hemingway as the loveliest in all of Africa, and outings to historic Olduvai Gorge, celebrated “Cradle of Mankind” where skulls and tools of man’s hominid ancestors, 1.7 million years old were excavated by Louis and Mary Leakey. Learn about the cultures, traditions and rituals of local tribes by visiting Maasai villages and those of their predecessors in the region, the Iraqw or attending evening lectures and tribal entertainments when available. You can also tour the coffee farms around Crater Forest Tented Camp, walking through groves of bushes laden with berries in all stages of ripeness, occasionally inter-planted with banana palms for shade. You can watch the soaking, fermentation, drying and roasting processes and taste fresh grown, fresh roasted Arabica and Robusta coffee. From then on, the evocative coffee aroma will always remind you of your African tour. Fresh, locally produced fruit, meat, poultry, and vegetables form the basis of hearty meals served in African or International style on your balcony on a special celebration or in the main dining room. Full board is available to suit your itinerary and packed meals are available. Special diets may be catered by arrangement. The Crater Forest Tented Camp safari day begins with Tanzanian tea or coffee on request brought with a smile to your own decking as forest mists give way to dawn. 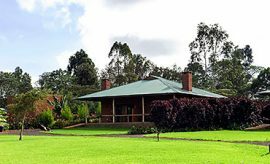 An early start will get you to Ngorongoro Crater on an extended game viewing drive through the montane forest and farms of the highland conservation area before you arrive at the crater floor gate for your allotted six hours of spectacular Ngorongoro Crater Tour. During the approach, you will have time to discuss and ask many questions about the Ngorongoro and possibly the wildlife you wish to observe and photograph; the guide will use his local expert knowledge, and sometimes supplemented with radio contact with his colleagues in the field to share and track the wildlife action as they occur or are sighted. Enjoy packed lunch on the crater floor before returning to relax with afternoon tea in the camp lounge. Then sip sundowner cocktails around the campfire to an accompaniment of chirping crickets. Take dinner in the atmospheric dining room where hanging lanterns and candles supplement the flickering glow of firelight. 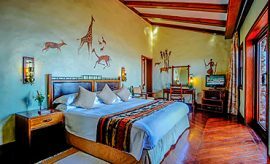 A Maasai guard will accompany you back to your tent chalet and light a crackling blaze in your fire pot to ward off the night-time chill. Within the perimeter of the farm, you may encounter small nocturnal animals on their nightly forage and hunt. 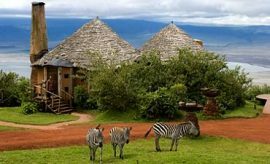 When staying at Crater Forest Tented Camp near Ngorongoro Crater - Highlands (Karatu Farmlands), we recommend combining it with your Northern Tanzania safari to Tarangire, Lake Manyara and Serengeti (wildebeest migration). End your trip with a Swahili cultural tour and beach holiday in Zanzibar.